The planning and workshops for this commission began over a year prior to completion, when I was taken, along with the three other commissioned artists, to the wasteland site where the new Goscote Palliative Care Hospice was to be built. With the building work almost complete in January 2011, my artwork, made over the previous year, was finally installed. For the reception I made a 3 metre tall LED light box and then a series of smaller landscape pieces for the lounges, seating areas and private rooms. This commission was carried out throughout 2010 and made in collaboration with the hospice users through regular workshops. I met with the "Friday Group" at the Day hospice on many occasions during the project and it was through discussions with people there that I developed the work for the new Palliative care hospice. Making artwork for the palliative care environment was a challenge but one which was very rewarding to work on. Talking to the people who were going to be using the new hospice, I realised that memory was of great importance to them all. After a few visits, they were soon all sharing their memories and experiences of local places. I was told stories from childhood and youth which took place in local nature reserves and parks just a short distance away from the hospice. There was an overwhelming feeling of life expressed by people when they spoke of the past. It was if the past was more alive than the present. Perhaps for many it was indeed like this. So, inspired by the stories I was told, I went off to find the places described to me. I wanted to capture the magic of these places almost as they were captured in people's memories. Many of the locations I returned to several times over many months until I achieveda result which both worked for me and the person whose 'story' it was to re-tell. 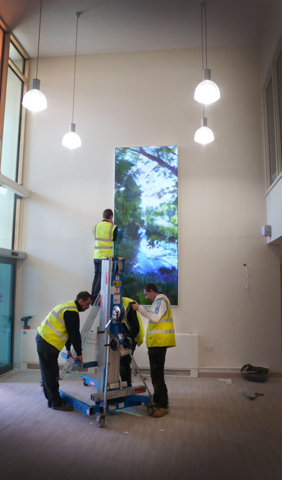 To the right are some photos of other pieces installed in the hospice.